Every body loves huckleberry pancakes. And now we have a Paleo version of your favorite breakfast food! If you are not familiar with a ‘Paleo version’ of pancakes, it uses non-grain flours rather than the typical wheat flours. I found this Huckleberry Paleo Pancake recipe on the Forest and Fauna website! Turn on griddle or stove top to medium heat. Whisk eggs, vanilla, honey, vinegar/lemon juice, sea salt and baking soda together. Stir almond flour into egg mixture. Add a tablespoon of coconut milk at a time until you get the desired consistency. I like to thin them out for lighter pancakes, so I go a bit heavy on the coconut milk. Melt about a tablespoon of coconut oil per batch, once the coconut oil is nice and hot, spoon the pancake batter onto the hot griddle. The trick to perfect almond flour pancakes is having the heat set at the correct temp, on my stove top, that is just below medium, and I have found it is important to really let the pan heat up for a few long minutes before dropping in the pancakes. NOTE: I also made these pancakes on the SMALLER side, so they are easier to manage and flip. Fry cakes until you see bubbles appear and cake sets up on the sides, this is a good indicator to flip. Watch heat, as cakes can burn easily. Keep cakes in a warmed oven until finished with batch. Cook on each side for about a minute or 2. Use a thin spatula to carefully flip them. Serve pancakes with preferred toppings. Wild huckleberries are certainly a very 'paleo' food! Almond flour does work as a flour substitute. At the end of the year, I like to look at the stats of my blogs and find out the top articles for the year. Originally written in 2009 and upated in 2014. Five Margaritas from Top Arizona Restaurants — inlcluding one huckleberry one! A page rather than a post, but proves to be a favorite page every year! Some interesting comments of this recipe! Simple recipe for a wonderful tasting drink! Found this Ol’ Fashion Huckleberry Pie recipe that I thought you would enjoy — simple and easy! Huckleberry Products for your Event? During the fall and winter, Tastes of Idaho, our sister site, does a booming business in special orders for the event industry. Inquiries come from people holding a holiday event, organizing an workshop or meeting, sending customer gifts…. even planning family reunions… They want to get some huckleberry products, favors, gifts for welcome packets, or just create fun memories… and what better way to do it, than with tasteful and tasty goodies? 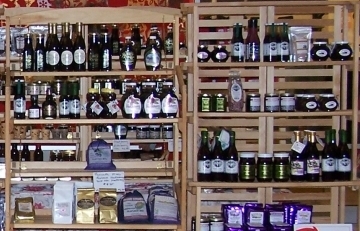 With our connections to the huckleberry and Idaho gourmet food industries, we can often put together a special bulk order, even with products we don’t show on our website. Popular items include lip balms (several flavors, including our top selling huckleberry), 2 oz or 4 oz huckleberry jams, SOAPS in a wide variety of scents and configurations, popcorn, honey, and all kinds of confections. Oh, and did I mention custom labels are available on many items?? Not every product is available this way with your own logo, company name, or event particulars. But depending on volume, and a small graphics charge, you would be surprised what we can come up with! Put your special holiday (or other event) date and information on your own private label, as a memory maker. Consider the impact of your company name on a huckleberry goodie that will REALLY stand out at a trade show or conference. Oh, and depending on volume, we can often do a 15% or more discount over regular retail prices! Give us a holler, and let us do come concierge shopping for you. Do remember that logistics for these larger orders do require a bit of extra time, ESPECIALLY if you want a custom label. Last year, we shipped out thousands of cool huckleberry items, including jams, lip balms, soaps, and candy for wedding favors, customer gifts, and conference welcome packs. Are you associated with an upcoming conference or other event in the near future, that I can help you make even more memorable?? Give me a quick call, and let’s see what we can find and create for you! Have you ever tried huckleberry crisp? I found this recipe on Beyond the Chicken Coop blog by Kathy. Here recipe uses granola for the ‘crisp’ portion which makes it very fun and easy to make. Mix huckleberries, sugar and ¼ cup flour together. Pour into a baking dish. In another bowl, mix granola, butter, and ¼ flour together. Pour granola mixture over huckleberries. Bake at 350 for 40-50 minutes. Check out Kathy’s full article include her picture of ‘purple hands’! New Facebook Group for Huckleberry Lovers! Join our Huckleberry Facebook Group today and get in on the fun! NOTE: Our “I Love Wild Huckleberries! Picking, Growing, and Cooking” is also active if you would like to like it as well! If you went picking already, and haven’t eaten all your huckleberries yet, let me share a recipe for Huckleberry Muffins! If you have never had huckleberries, they are similar to blueberries in texture, but the taste is a bit different. Pop a handful of these little berries in your mouth and you are hit with a burst of tart flavor, followed by a sweetness unlike any other. Just a perfect combination for some yummy muffins. Combine dry ingredients in a large bowl and stir with wooden spoon. Add wet ingredients and stir until well combined. Pour batter into muffin pan, filling each section ¾ full. If you want to add a crumble top, mix together ⅓ cup of flour, ⅓ cup brown sugar and ¼ cup melted butter. Sprinkle on top of muffins before baking. Recipe was found on Spoonie Foodie blog. Check out the full article for the cute story about The First Batch of Huckleberry Muffins! Did you know that bumblebees are the prime pollinators for huckleberries? Not the honey bees! Huckleberries and bumblebees … I sure did not know that! According to a Outdoor blog posted on the Spokesman Review …..
Sure, honeybees get the glory and we get their honey,but wild bees (about 150 different species probably occupy northeastern Washington), including bumble bees, pollinate far more crops, including many of those in our gardens, than the honeybee,” says Chris Loggers, wildlife biologist with the Colville National Forest. Lets continue to ‘be nice’ to our friends the bumblebees! I hope you had a wonderful huckleberry holiday season! Personally, we sent huckleberry products and gift baskets from our Tastes of Idaho site to over 27 states — and even one basket to Ireland!! By the way, we are currently running a After the Holiday sale on the site. Check it out here to receive 35% off your order!! Preheat your oven to 350. Use shortening and flour to ready your bundt pan or spray generously. Sift together flour, baking powder and salt. In the bowl of a standing mixer, beat butter and sugar together until light. Add eggs one at a time, and then add orange zest, vanilla and almond. Mix thoroughly and add dry ingredients alternately with buttermilk. Fold in berries, pour into pan and bake ~50 minutes until top springs back easily. Cool at least 8 – 10 minutes and then turn out onto a plate or rack. FROSTING: Begin heating sugar and water /juice in a small saucepan. Add a candy thermometer to the pan. Continue to boil as you froth two egg whites in the base of a standing mixer. Add cream of tartar when egg whites are frothy, stop beating. When sugar reaches about 225 degrees, begin whipping the egg whites on high until peaks form. When sugar mixture reaches 240 or soft ball stage, remove from heat and pour in a steady stream into whites, with mixer running on low. Beat for 7 full minutes until fluffy and glossy – and add half teaspoon vanilla. Just wanted to post a note about our annual 10% off pre-Christmas sale on Tastes of Idaho website — running November 16 to November 19, Sunday through Wednesday. If you are looking for special huckleberry gifts for your friends and/or family, this is the place to see the one of the largest online selection of huckleberry products. Note that we are happy to DELAY shipments to your friends and family … just be sure to make a note in the comments upon completion of your order. Otherwise, we usually send in 1 to 3 business days, depending on sales volume. Remember: Sales starts this Sunday and runs until Wednesday! 160 mySQL queries in 0.858 seconds.